Spring-fed waters are luxurious places for salmon and trout. They provide ideal flows and temperatures year-round and jungles of aquatic plants teeming with insects for easy snacking. In real estate, the saying goes, three things matter: “location, location, location.” Can the same be said for native fish? Are fish that reside near their stream’s source springs better off than those living 10 miles downstream? To find out, researchers at the UC Davis Center for Watershed Sciences set up an experiment this summer on the Shasta River and its volcanic spring-fed tributary, Big Springs Creek. The results could have important implications for the recovery and conservation of California’s imperiled runs of native salmon and steelhead trout. 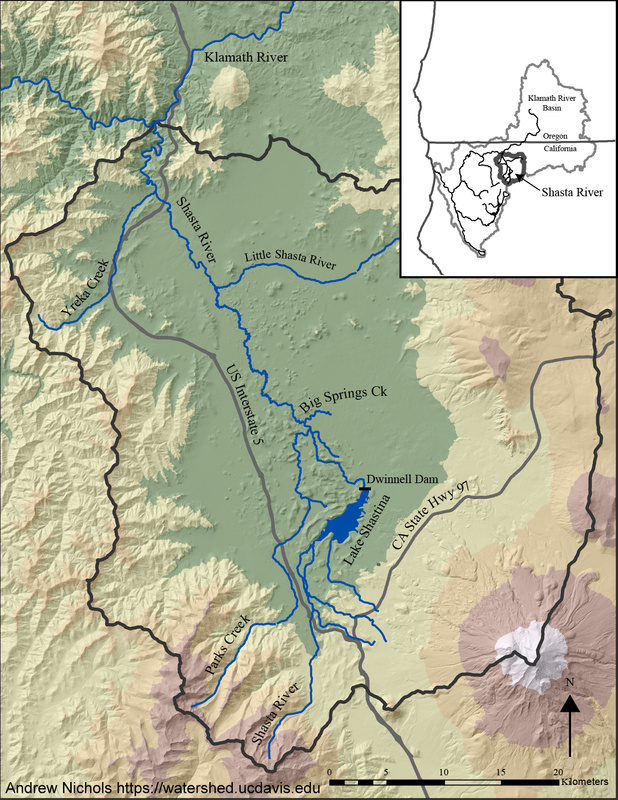 Big Springs is rich in geologically derived nutrients that enhance productivity of the aquatic food web – plants and phytoplankton that feed insects, which feed fish. Previous monitoring in the study area has shown that nutrient levels in summer decline with distance from springs, as do the densities aquatic plants and insects that provide habitat and food for fish. Fish growth would seem to be similarly influenced by proximity to springs, the prime source of the nutrients nitrate and phosphorous. To put this hypothesis to the test, the UC Davis researchers built five fish enclosures at each of five sites spanning a 10-mile stretch downstream of the source springs. They stocked the enclosures with hatchery-raised juvenile coho salmon for eight weeks of study. 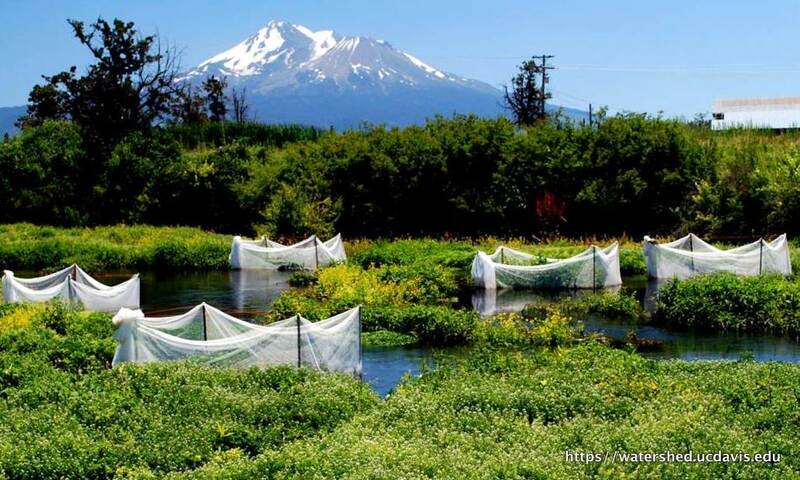 Identifying sites of prime salmon habitat is critical to recovery and conservation of endangered Southern Oregon/Northern California coastal coho salmon in the Shasta River basin and elsewhere. Sections of rivers and streams strongly influenced by springs may provide exceptional habitat for rearing coho. Research shows that bigger juvenile salmon and steelhead are more likely to avoid predators, thrive in the ocean and return as adults to spawn in their natal stream. The 2.2-mile Big Springs Creek and the portion of Shasta River it feeds are particularly promising strongholds for salmon and steelhead. They’re part of the Klamath River system, which once produced the third largest salmon run in the continental United States, behind the Columbia and Sacramento rivers. Sources of Big Springs include the only glaciers in the U.S. known to be growing in the face of climate change. While warming temperatures have hastened the retreat of glaciers in the Sierra Nevada and the Rocky Mountains, those flanking Mount Shasta have advanced as a result of changing weather patterns over the Pacific Ocean. A warmer Pacific means more moisture sweeping over Northern California, falling as snow on Mount Shasta, a volcano that stands 14,162 feet above sea level. The snowmelt percolates through porous volcanic rock, picking up significant amounts of nutrients before surfacing decades later at springs around the volcano’s base. In Big Springs Creek the water emerges at a constant 80 cubic feet per second – the equivalent of 80 basketballs full of water every second. Such a high and steady volume of cold water makes for excellent salmon and steelhead habitat. Between now and September the researchers will continue to quantify how proximity to these luxurious springs affects salmon growth and the habitat, food availability, temperature and other conditions supporting their production. Stayed tuned to California WaterBlog for results later this year. Robert Lusardi is the lead researcher on the coho salmon growth project. He is a PhD student in ecology working with Professor Peter Moyle, associate director of the UC Davis Center for Watershed Sciences. Jeffres, C., R. Dahlgren, J. Kiernan, A. King, R. Lusardi, A. Nichols, S. Null, S. Tanaka, and A. Willis. 2009. Baseline Assessment of physical and biological conditions within waterways on Big Springs Ranch, Siskiyou County, California. Technical Report prepared for the California State Water Resources Control Board. Jeffres, C., Aug. 24, 2011. “Benefits of growing up in a spring fed stream.” California WaterBlog. Moyle, P.B., Oct. 12, 2011, “Coho in Crisis, Part 2: Saving coho, saving salmon, restoring streams.” California WaterBlog. Moyle, P.B., Oct. 12, 2011. “Coho in Crisis, Part 1: “The decline toward extinction in California.” California WaterBlog. Nichols, A.L., C.A Jeffres, A.D. Willis, N.J. Corline, A.M. King, R.A. Lusardi, M.L. Deas, J.F. Mount, and P.B. Moyle. 2010. Longitudinal Baseline Assessment of Salmonid Habitat Characteristics of the Shasta River, March to September, 2008. Report prepared for: United States Bureau of Reclamation, Klamath Basin Area Office. Video | This entry was posted in Uncategorized and tagged Big Springs Creek, Robert Lusardi, salmon. Bookmark the permalink. Please do have a look at the NOAA research entitled “Working with Beaver to Restore Salmon Habitat” Forward looking areas are re-introducing beaver, whose ponds are a terrific habitat for young salmon. And spawning salmon do get over those little dams. Thanks for the tip, Gail. Great idea. I have seen something similar in Romania, where are special places to breed salmon for sale. They use springs coming from mountains and have good results.